This whole crazy healthy living blog world was created years ago because many of us realized how much we liked seeing what other people were eating, and how they were making a healthy life work for them. I still love seeing what my blogging colleagues are eating and cooking and the life snippets they share in-between. And so like a “normal” healthy living blogger, I arranged my groceries out on my dining room table so you could peek into my shopping cart. What did I buy and why? Let’s see. (I generally don’t plan Friday/Saturday because I’m usually out, at parties, with friends, etc and can always pick up groceries over the weekend to cook if I go that route). My fridge was also very empty – out of milk, fruit, eggs, etc., so this was a larger-than-usual trip for me. -Kale was 3 bunches for 5 this week, so I bought two curly and one lacinato to use for salads throughout the week. -Eating all the grapes this fall! These are for breakfasts/snacks. -Lemon because I always have one on hand. I’ll probably use it for one of the kale salads. -Strawberries one last time before they are gone. Mazen loves them in his lunchbox. -Tea because it’s now cold outside and I drink tea most evenings. Sleepytime is my favorite, and the chai is for a recipe I’m working on! -Carrots and celery for the split pea soup, and the sweet potato is to make a batch of sweet potato fries for Mazen’s dinners. -And peaches/pears for Mazen’s lunchbox. I aim for fresh fruit, but when we’re out of fresh I pack one of these or an applesauce. -YoBaby yogurts for Mazen’s lunchbox. He loves the banana/mango. -Broccoli to roast for dinner. I took a shortcut and got the pre-washed kind. –Bonne Maman raspberry preserves is the BEST JAM I’VE EVER HAD. -Bulk cumin because I was out. -Spinach Feta pizza for a quick dinner for Mazen. He ususally has one of these throughout the week. He calls them “salad pizzas” and I consider them a great option in a pinch! There ya have it! This was about $90 total. While I don’t strictly buy organic produce, I do buy it when I can to support the industry. I do strictly buy organic milk/eggs. 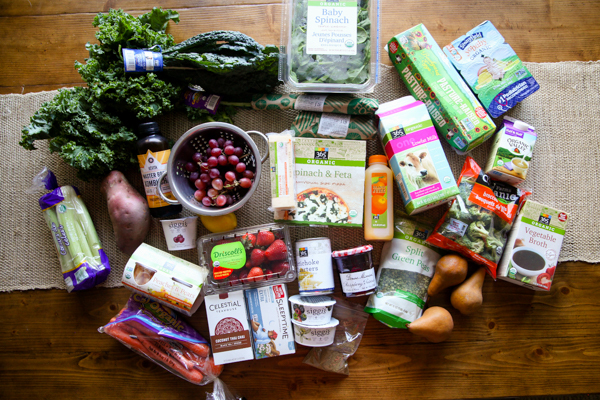 I am sure this lot would have been less expensive at another grocery store, but I probably wouldn’t have been able to get everything I needed under one roof anywhere else, which is one reason I love Whole Foods. It’s a one stop shop for me, and I love the shopping experience there. And I don’t think the produce anywhere else in town compares. 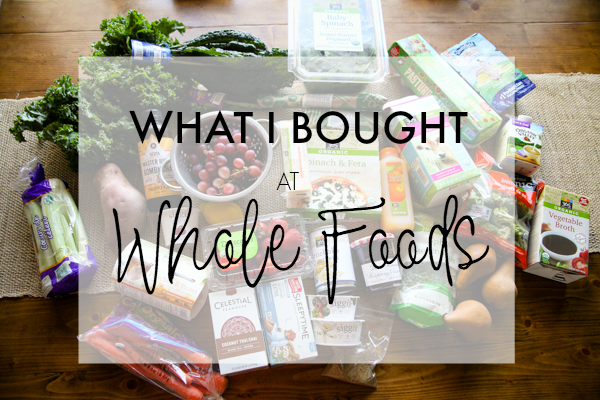 I have been going to Trader Joe’s more to safe a few dollars and stock up on the things that they do best, and I head up to Costco every now and then to get some things in bulk, like canned pumpkin or crackers. I forgot to add “closest to me” as a huge plus too! I love Siggi’s so much!! This is awesome! Grocery shopping is all about trade-offs, sometimes it’s like a game to me. Most often I chose not to go to another grocery store to save a few bucks. I try and use coupons as much as possible so that covers the cost. I try to exclusively buy meat (pork and beef) from Whole Foods because I care about the animal welfare rating system. Bonne Maman is my favorite! The Blueberry is also excellent. Nom nom! Nice haul – I am intrigued by Thai Chai and may have to try it! I toured many parts of the Driscoll’s operation in California for work two years ago, and the good news for Mazen is that strawberries won’t be going anywhere! They have mastered the science of growing berries – including organics – year-round. So keep eating those berries all winter long, M! We moved three months ago to a town without a Whole Foods. Last night I drove to the where we used to live to see a friend and I took a cooler to stop at Whole Foods. I almost cried when I walked in because I missed it so much. I love their frozen salmon – it’s a value pack they offer ($19.99 for 6 fillets) and I buy it every time I’m there. I also love those pasture eggs. I hate to say it but I think they are sometimes even better than local eggs. I always forget about bulk bins for spices. Thanks for the reminder! Bonne maman is that good because, well, it is full of sugar, one of the sweetest on the market. But why not?!! I would love to shop at WF for the big grocery haul each week, but with two tween boys it is just not financially possible. I love Harris Teeter and find it affordable if I use the weekly specials plus coupons. 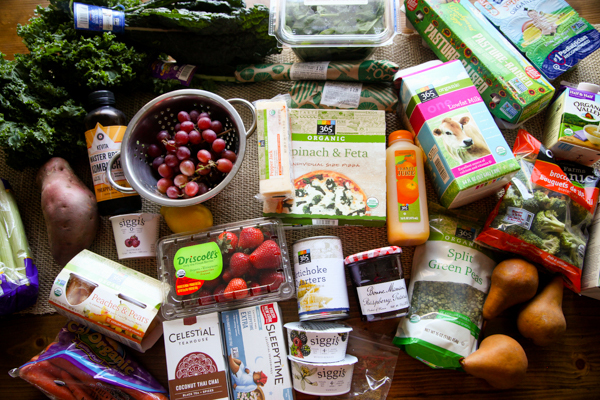 We can buy a week’s worth of food, including snacks for $150, which is pretty darn good! That is good for two hungry boys! I LOVE posts like this so thank you for sharing. 🙂 Have a great week! Totally agree with you re:Bonne Mamman. I discovered it years ago in France and bought many jars to carry around on my trip and eventually bring home, only to find out it is sold all over the place! Haha! That’s something I would do. $90 is really good for an entire week for you two. 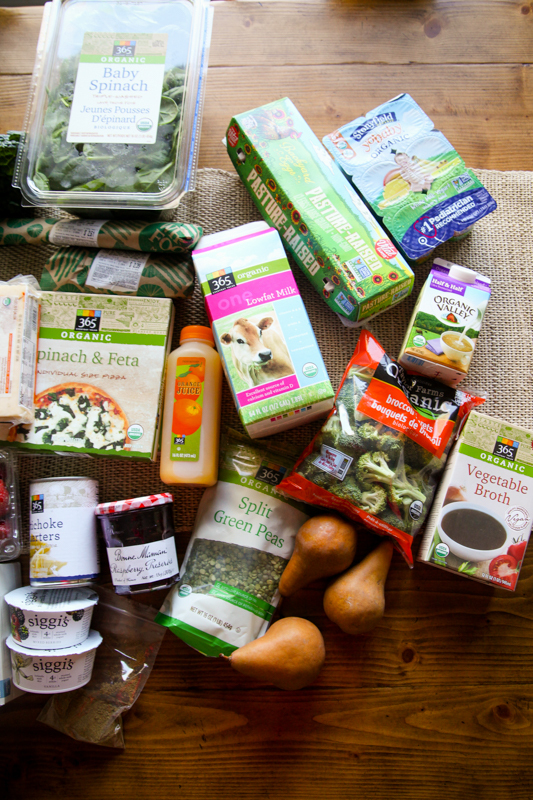 I agree that Whole Foods is great not only for the organic products and fresh produce, but also for the experience. It’s the best and I miss it so much!! Love posts like this! Thanks!! I wish we had a Whole Foods closer to us, we have a MOMs and a Common Market (but they are small and often don’t have the things I need). Healthy food is the best food! I love these types of posts/peeks behind the curtain! Wow- I can’t feed my family of 5 for less than $300/week (cooking from scratch) and, like you we eat out twice a weeekend. What do you eat for lunch? Leftovers most of the time. Or a salad. I’m always amazed by how cheap groceries are in the United States, yes, even at Whole Foods. Compared to Canada, it’s insane. Our groceries here are sooooooo expensive. I remember shopping in Whole Foods in New York (just for a few snacks while on vacation), and I couldn’t believe the low prices. Groceries are SO cheap compared to here in Canada(I’m in Vancouver now!). 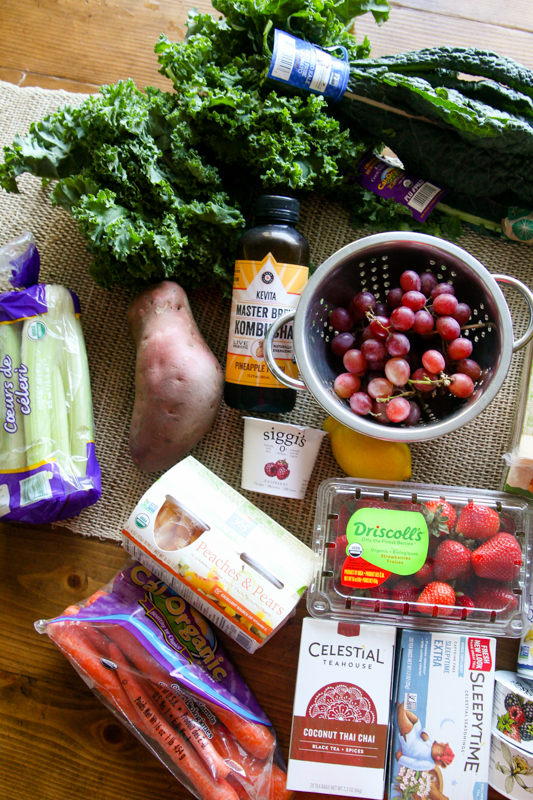 I regularly spend about $500 a month on groceries for just my husband and I. Sure, I have to eat gluten-free so that adds up but I’m impressed by how cheap you can buy things even at Whole Foods! I love posts like this with your meal plan for the week and the food you bought. Gives me ideas for my meals. Thanks! Also, love Whole Foods and Trader Joes but closest ones are 1 1/2 hours away. I do take my cooler when I shop there, about once a month. Hi Kath, I’m not sure if someone mentioned this to you or not? But it seems whenever I come to your homepage lately – it’s not your newest post that appears. Like today, your Whole Foods post is the main page even though I know you have a newer post up. Maybe it’s something wonky with my own browser – but thought I would mention! OH weird, I have two new posts. It probably is a cache thing with your browser though, although I’m not sure how to tell you how to fix it permanently. Me too – and may be an issue on my side, but seems to have only started happening about a month or so ago. This is happening for me too!